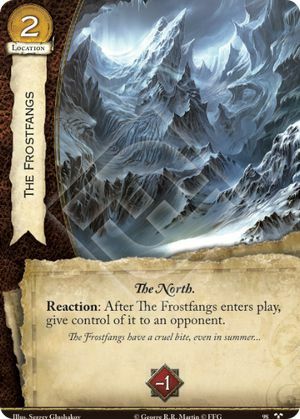 Reaction: After The Frostfangs enters play, give control of it to an opponent. Cards revealed in setup are considered to be "already in play" when the game begins, so their "enters play" abilities do not trigger. Placing The Frostfangs in setup is probably a bad idea.